4. 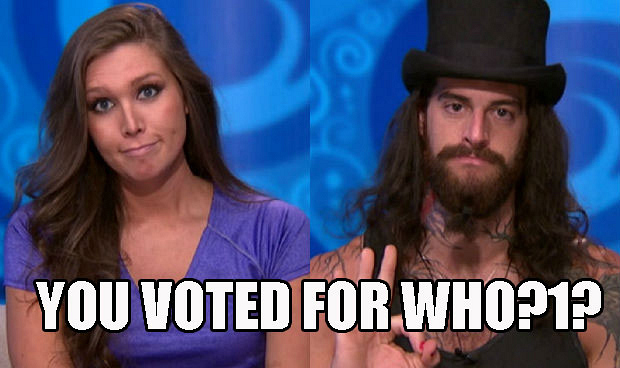 Audrey and Austin cast unexpected votes. After all the scheming and plotting to backdoor Jace, we were a little surprised by who Audrey and Austin voted to evict. Audrey, who was chomping at the bit to get the surfing streaker out of the house, placed her vote for Jackie, who was really just supposed to be a pawn on the block. Then you've got Austin, who's been involved in a pretty intense bromance with the pony-tailed personal trainer since Day 1—and that's exactly who he voted to evict. Guess all's fair in love and Big Brother.